Taking Sustainability to the next level. From growing grapes to making wine there are countless ways to reduce resources, gain efficiencies and improve overall quality. This site showcases some key ideas to making great wine while making the world a better place. Cleaning is one of the most repeated and critical steps taken in a winery. 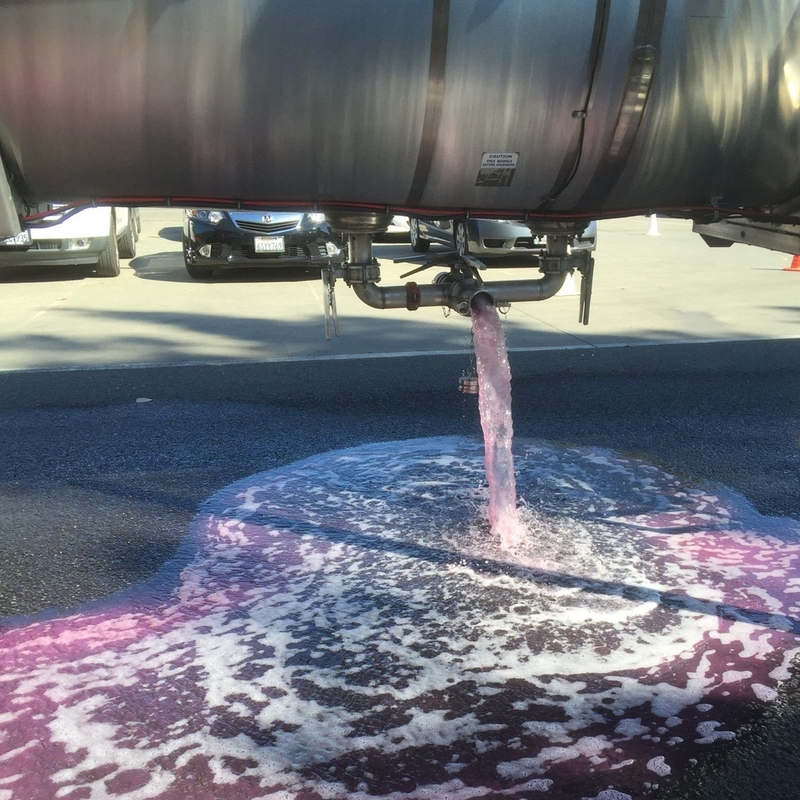 Sanitation impacts wine quality, water use, wastewater strength, staff time and process flow. Sustainable grapes make better wine. Drip irrigation, integrated pest management, fertilizer use and operational decisions can all be used to transform the vineyard into a low impact ecosystem. Water is essential to any operation in a winery. Measuring and monitoring water use is key to making every drop of water count. Water efficiency and reuse are vital to reducing the water to wine ratio for a winery. Wastewater is a part of winery operations. Turning that wastewater back into usable water allows every drop to be used twice. Wastewater management involves looking at opportunities to reduce wastewater volume and wastewater strength. Zero Waste is possible and easier than you might think. Learn about wineries, tasting rooms and other facilities that have not only achieved Zero Waste but received certification. Energy use represents a significant cost for most wineries that is often treated as the cost of doing business. Efficiency improvements have the potential to reduce costs by 30% or more. New tools, techniques and processes apply modern science and innovations from other industries to make the highest quality wine with the lowest possible footprint. What is the carbon footprint for a bottle of wine? Vineyard operations, winery energy use, packaging and transportation all contribute to the bulk of greenhouse gas emissions. Opportunities exist to reduce direct and indirect pollution associated with each step. Certification helps communicate quality to customers. See some of the existing winery and vineyard certification systems both in the U.S. and around the world. Sustainability Strategy involves embedding sustainability across the organization. This unlocks the true value of sustainability efforts by supporting marketing, sales, and new business opportunities. Do you want to implement a sustainability program at your organization? Are you interested in taking your current sustainability program to the next level? For more information about sustainability solutions for your organization contact me. Focusing on efficiency can equate to better designed systems, and savings in labor, costs and materials. By analyzing data and implementing solutions I help optimize wherever possible. Sustainability can not only reduce operational costs, but can open up new business opportunities and strengthen existing ones. These advantages can give sustainability leaders a significant competitive advantage while reducing risks and increasing overall resiliency. Doing less bad in not a viable option, we need to be doing more good. A focus on regenerative systems that work to enhance each other and create added value leads to solutions that can transform companies, communities and ecosystems. Aaron Schreiber-Stainthorp is the Sustainability Manager at Jackson Family Wines (JFW). In his role at JFW, Aaron focuses on implementing systems that drive transformational change with an emphasis on carbon emissions, energy efficiency, renewable energy, water conservation, zero waste and employee engagement. Using a data driven approach to identifying opportunities and guide decision making, Aaron has worked to make sustainability synonymous with innovation and continuous improvement. In addition to his work at JFW, Aaron also runs a small consulting firm, Sustainability Squared, which focuses on embedding sustainability in the food and beverage industry. Aaron is also a board member with the Center for Climate Protection, focused on speed and scale GHG policy solutions in California. Aaron has spent 5 years working in the wine industry, and previously led sustainability efforts at Francis Ford Coppola winery resulting in their 2017 Sustainable Winemaking Leadership Award from the California Sustainable Winegrowing Alliance. Prior to working in wine, Aaron managed energy efficiency education programs at the Alliance to Save Energy. Working with schools nationwide he developed energy efficiency programs that trained 30,000 students, resulting in measurable energy savings of over $3.4 million at participating schools. Aaron has an MS in Sustainability Management from the Kogod School of Business at American University, a BS from Northland College and is a former EDF Climate Corps Fellow. When not looking for ways to reduce water and energy use, you can find Aaron riding his bike around Sonoma County, or backpacking around Northern California.Aaron Schreiber-Stainthorp is the Sustainability Specialist at Jackson Family Wines. When not looking for ways to reduce water and energy use, you can find Aaron riding his bike around Sonoma County, or backpacking around Northern California.